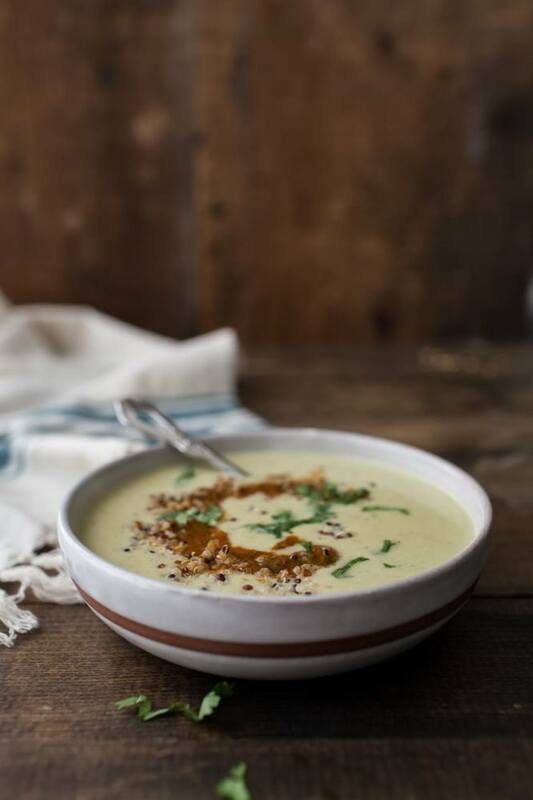 Sweet Corn Soup with Harissa | Naturally. I know, it’s probably hot where you are and that soup is probably one of the last things you want to whip up. And yet, if you’ve never made soup with fresh sweet corn, I would be remiss if I didn’t tell you that you were missing out. Sweet corn soup is hands down, one of my top five soups (because I refuse to pick just one of anything.) 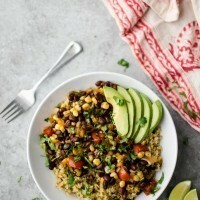 The flavor of sweet corn in the soup is akin to the flavor of eating it right off the cob and since I like my sweet corn a bit on the spicy side, this soup is perfect. 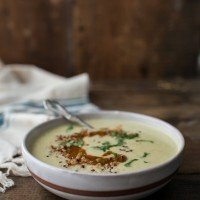 This recipe doesn’t make an overly large batch of soup so I would recommend tripling the amount and freezing any leftovers you mights have. Also, in my mind, the toasted quinoa is optional. I like that it adds a bit of heft to the soup but the real work in this soup is done in the corn base and the harissa swirl. Remove kernels from cob, keeping both. In a stock pot, heat olive oil over medium-low heat. Add diced onion and cook until translucent, 6-7 minutes. Stir in sweet corn and cook for another 5 minutes, letting corn heat up and soften slightly. 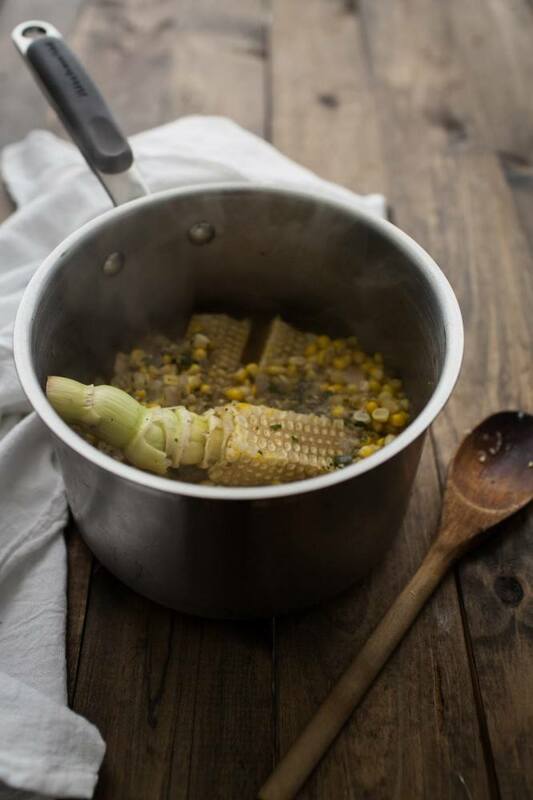 Pour in vegetable broth, mix in the seasoning, and add the corn cobs. 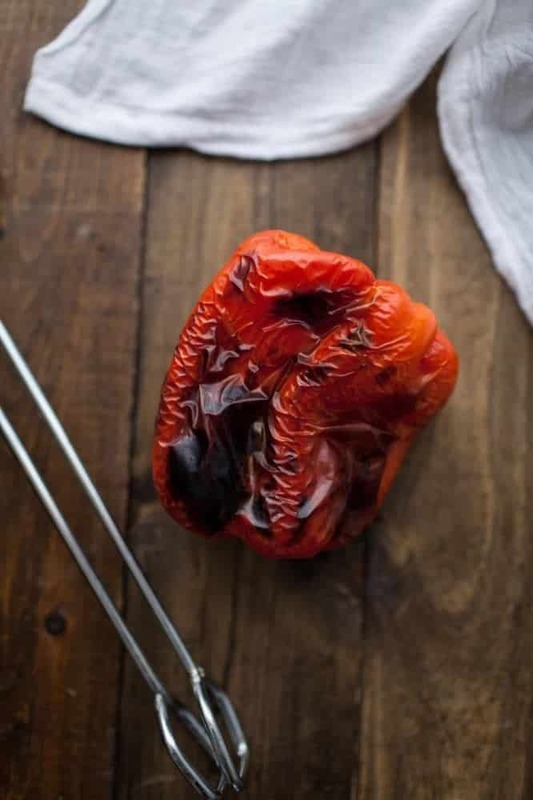 Bring to a boil, reduce to a simmer and cook for 15-20 minutes while making the harissa. After the time, remove the cobs and puree the soup in a blender. If smooth soup is desired, pass liquid through a fine mesh sieve back into the pot, pressing down with the back of a spatula to remove all liquid. If not, return all soup back to pot. Stir in heavy cream and heat soup over low until hot, but not boiling. In a small skillet, heat olive oil over medium-high heat. 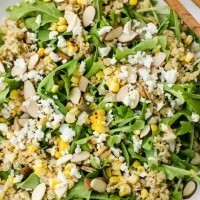 Add quinoa and sauté until quinoa begins to pop and is crisp, 3-4 minutes. Remove from heat. 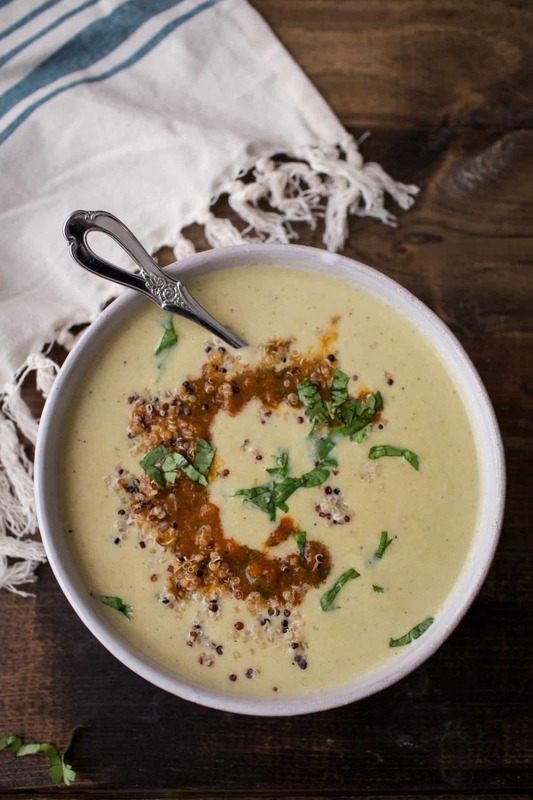 Assemble soup back dividing into two bowls, spooning in a swirl of harissa, and topping with crispy quinoa. I adore sweet corn soup. It’s definitely worth making soup in the summer for. Your photographs are gorgeous. 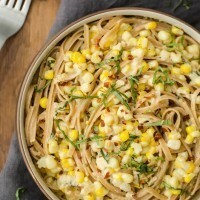 What a delicious way to eat fresh summer corn! Now I really need to visit the farmer’s market this Sunday. 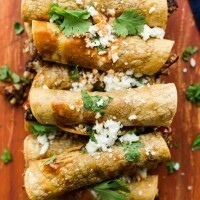 🙂 I love the idea of spicing it up with harissa too. NOM, etc. normally i would not have cared for soup since its so hot in Dallas, but this one just looks fabulous, hard to pass. This sounds delicious! I love harissa! When I click on either of the links to your Harissa sauce recipe, it takes me to a tahini recipe instead (unless I’m missing something…). Thank you. The link now directs to the correct post. 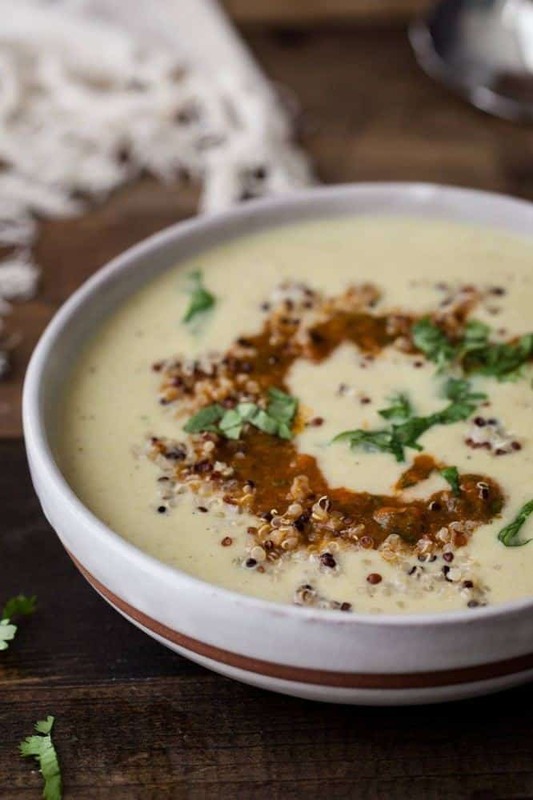 I love corn soup and I love harissa….but have never thought to combine them in such an interesting way! Can’t wait to try! I love fresh summer corn soup. 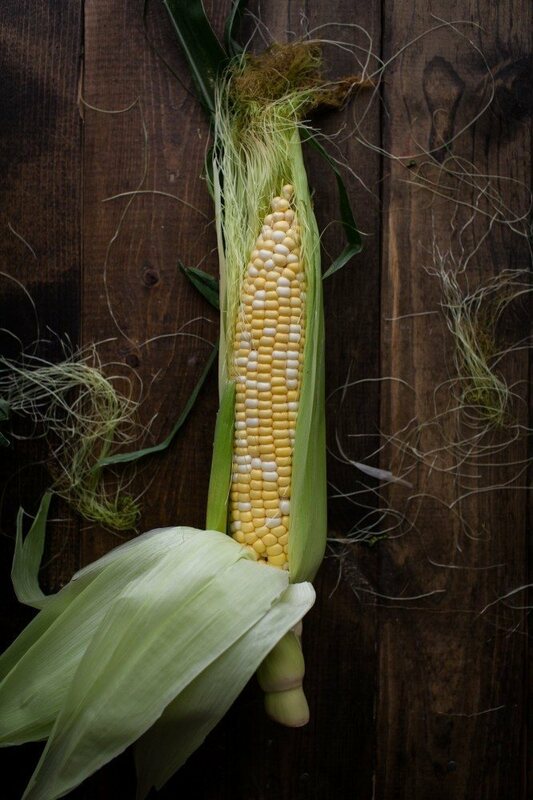 Harissa definitely sounds like the perfect compliment to the sweet corn. There can never be too many recipes for harissa, in my book! 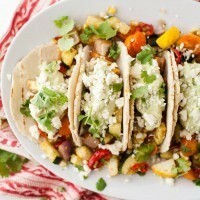 Sweet corn paired with spicy harissa sounds like a pretty perfect combo to me! This soup is mesmerizing. So stunning — and now that you’ve said it, I can’t stop thinking about how perfect harissa and sweet corn would be together. This is gorgeous in every way!